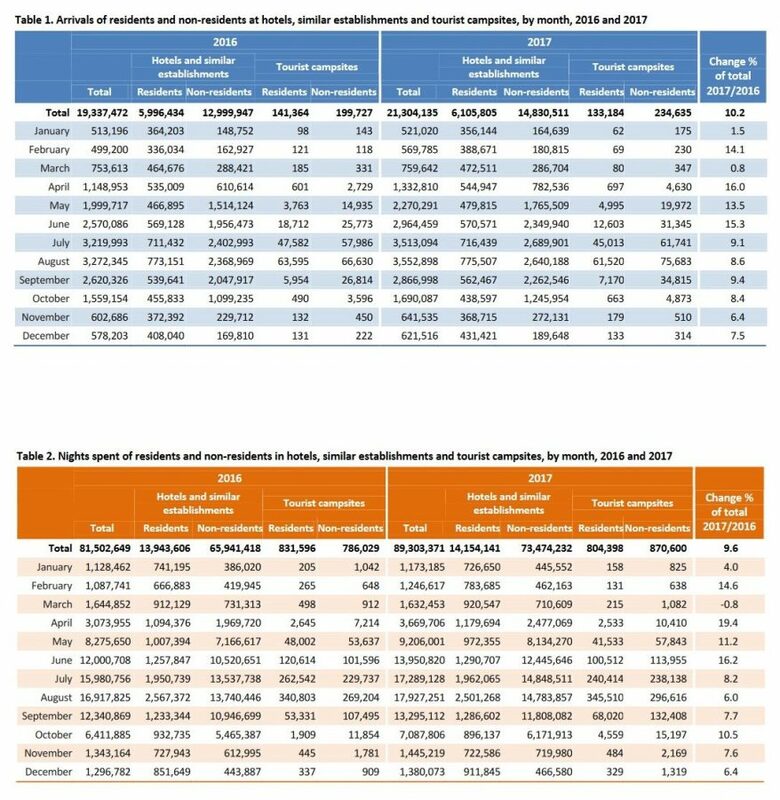 In 2017, compared with 2016, an increase of 1.6 percent is recorded in arrivals and 1.2 percent in nights spent by residents and 14.1 percent in arrivals and 11.4 percent in nights spent by non-residents. 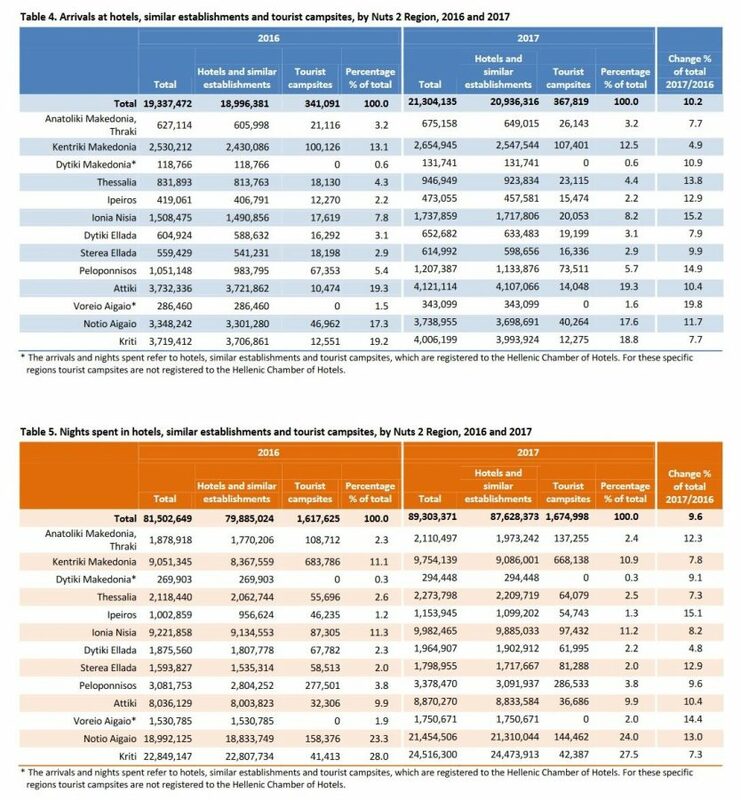 The annual occupancy of bed-places in hotels and similar establishments (excluding tourist campsites), which is calculated by taking into account the nights spent compared to the bed-places that were in operation, amounted to 52.8 percent in 2017, compared with 50.1 percent in 2016 (Table 3). According to monthly data, 85.4 percent of the arrivals and 92.3 percent of the nights spent, in hotels, similar establishments and tourist campsites of Greece, are recorded during the April-October 2017 period. In regards the breakdown of the survey data by region (NUTS 2), an increase is observed in arrivals and overnight stays in all of Greece’s regions. A significant increase of arrivals, in absolute values, in hotels, similar establishments and tourist campsites is observed in the South Aegean (11.7 percent in arrivals and 13 percent in overnights), Attica (10.4 percent in arrivals and 10.4 percent in overnights), Crete (7.7 percent in arrivals and 7.3 percent in overnights) and the Ionian Islands (15.2 percent in arrivals and 8.2 percent in overnights) / (Tables 4 and 5). 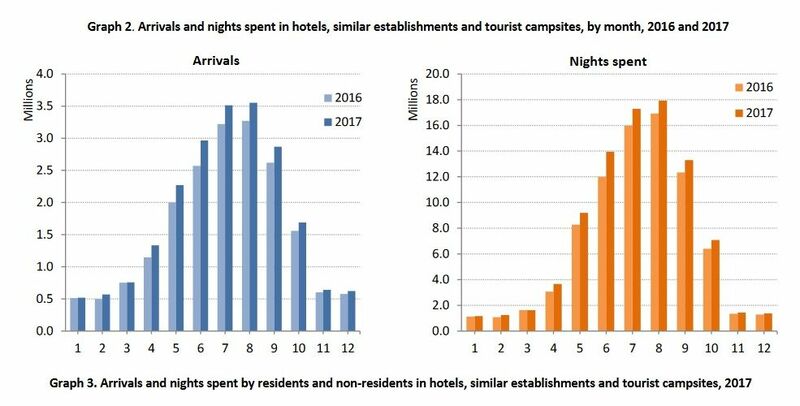 In 2017, the largest share of arrivals and nights spent in hotels, similar establishments and tourist campsites, is recorded by non-residents, i.e 70.7 percent of arrivals and 83.2 percent of nights spent (Graph 3). Moreover, in 2017, the largest share of arrivals and nights spent by non-residents in hotels, similar establishments and tourist campsites is recorded by customers/guests whose country of residence is in Europe (82.1 percent of arrivals and 91.1 percent of nights spent) with significant contribution from the EU Members States (68.1 percent of arrivals and 75.6 percent of nights spent). The largest contribution concerning arrivals is recorded for Germany (13.6 percent of arrivals and 18 percent of nights spent), United Kingdom (13.2 percent of arrivals and 16.1 percent of nights spent), France (7.7 percent of arrivals and 6.7 percent of nights spent) and Italy (4.9 percent of arrivals and 4.1 percent of nights spent). For the rest of the European countries, the largest contribution is recorded for Russia (5.6 percent of arrivals and 7.7 percent of nights spent). The data refers to arrivals and nights spent at hotels, similar establishments and tourist campsites that are registered in the Hellenic Chamber of Hotels. The results of the survey refer to about 80 percent of the total bed-places that operate in Greece.